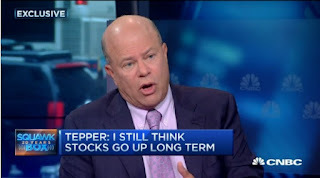 Hedge fund billionaire David Tepper said Thursday he's "not as bullish" as he could be—taking a more cautious view of the stock market almost five years to the day since his comments on CNBC sparked the "Tepper Rally" in the stock market. "I have problems with earnings growth [and] problems with multiples," he said. "So I can't really call myself a bull [near-term]," said Tepper, founder and president of Appaloosa Management, which currently manages more than $20 billion. Appearing on "Squawk Box" as investors look to next week's meeting of Federal Reserve policymakers, Tepper said it might be a good time to take money off the table, adding that he has lots of cash right now. "We have some longs and shorts and we're hedged in, but we don't have a huge equity book right now," he said. Tepper called the stock market environment "challenging" and questioned whether earnings estimates for next year are too high. Acknowledging he was not as definitive as usual, he said he's "not loving it," but if stocks were to fall 20 percent or so he'd be a buyer. He added that he still believes the market will go higher in the long term. As for all the recent wild swings in the U.S. stock market, he blamed global reserve drawdowns. Money flows are not going in one direction anymore, he continued—warning the market should remain volatile as investors adjust to the new realities. He said world economic growth is looking lower at a time when the Fed appears to be ready to raise interest rates while most other central banks are easing. "The United States is not held hostage by the global economy. 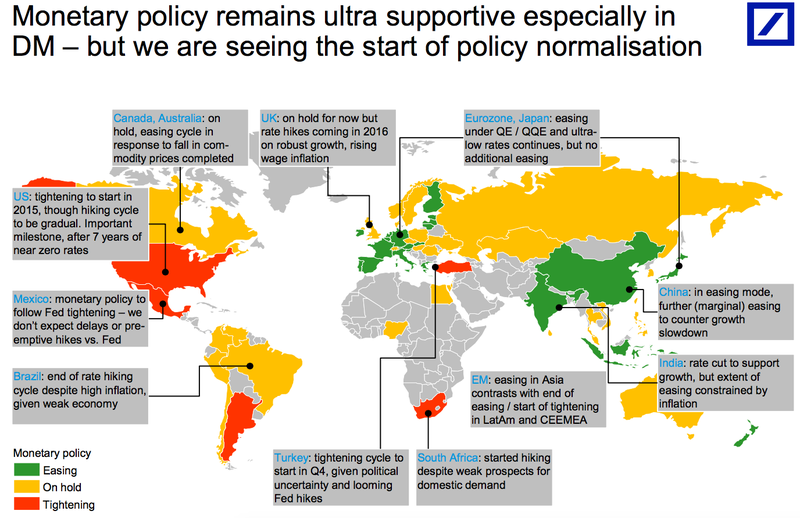 The U.S. stock market … which is 50-50 U.S. and the rest of the world is not the U.S. [economy]," Tepper said. Growth and margins for corporations matter more than the Fed, Tepper said, adding that it's a moment to pick individual stocks. During a memorable appearance on "Squawk Box" in September 2010, the Appaloosa boss sparked the so-called "The Tepper Rally" when he said the Fed's asset-purchase program virtually guaranteed strength in stocks. Since then, the S&P 500 has gained more than 70 percent. In the current market, he thinks Apple is a cheap stock, which he has a small position in, "about 0.75 percent of our book." 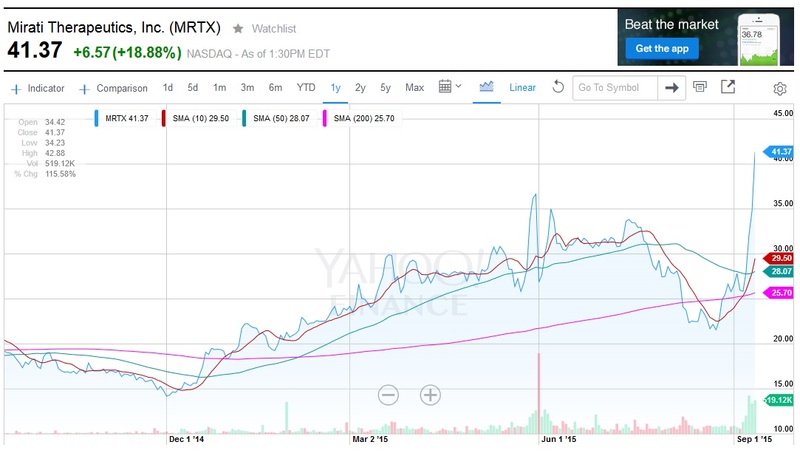 "It does have a lot of Chinese exposure for it's growth, which is a bit of a problem. But the multiple is low so I can deal with it," Tepper said. "[But] it's always going to have a lower multiple," he argued, "because it is still a device company that, even though people think it can't be replaced, still something can come along." While Apple's exposure in China may not be that troubling for Tepper, he's pretty down on the stock market there. "We were involved in China. I was reading the situation there wrong. I thought they were easing when they were not easing, and I lost money in the Chinese market," Tepper said, adding that he sold his stake in Chinese e-commerce giant Alibaba in early July. "[The Chinese] just keep making policy mistake, after policy mistake, after policy mistake over there," he said. "It's a learning curve to get onto a market economy. You could say that. And maybe one day they'll get it." But Tepper said it's not good when that "learning curve" is playing out in real time in the world's second-largest economy. "It's kind of bad when they're a $10 trillion or $11 trillion economy and they influence more than a third of the world's economy." It's been a tough year for hedge funds with most seeing gains erased for the year, after August's wild market rout on China concerns. Appaloosa on the other hand, is reportedly up over 12 percent net for the year through August, according to a person familiar with the matter. 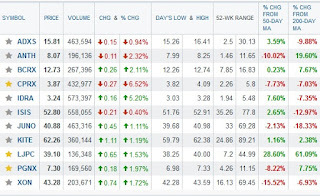 By comparison, the HFRI hedge fund index fell 1.87 percent for August—paring year-to-date gains to just 0.2 percent. Though 2014 was a relatively low-key year for Appaloosa, up a meager 2.2 percent net of fees, Tepper's track record is undoubtedly one of the best in the industry. The fund returned a record 42 percent in 2013 and has had only three down years in its history: 1998 (down 29 percent), 2002 (down 25 percent), and 2008 (down 27 percent), according to the book "The Alpha Masters." But the years after those declines, the fund had record net performance in 1999 (up 61 percent), 2003 (up 149 percent) and 2009 (up 132 percent). Appaloosa returned 10 to 20 percent of investor assets at the end of last year, the fourth-straight year of returning money to clients. In some other past calls, Tepper told "Squawk Box" In May 2013 that the Fed had to taper its bond-buying to keep the stock market advance on an even keel. The term "taper" become common parlance on Wall Street, and gave rise to the phrase "taper tantrum." 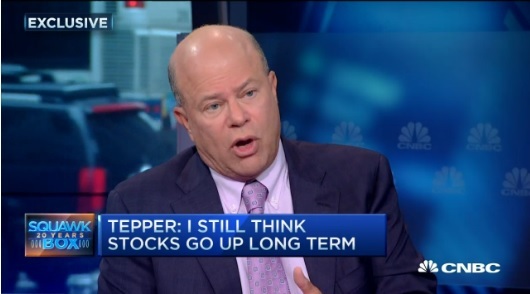 In October 2013, Tepper told CNBC the Fed would not taper for "a long time now." The central bank started its gradual paring back of asset purchases in January 2014. In May 2014, Tepper was more cautious, when speaking at SkyBridge Capital's SALT 2014 conference in Las Vegas, saying "don't be too frickin' long right now." By December 2014, Tepper said in an email to CNBC: "This year rhymes with 1998. Russia goes bad. Easing [is] coming from Europe. Sets up 1999 … [oops] I mean 2015." He said he wasn't calling a top for in the market for the year. "You [just] have to be aware of the possibility for some sort of overvaluation of the markets." I listened to David Tepper on Thursday morning and thought he presented an interesting case on how cross currents on the global front are creating massive volatility. As he states: "If all the rivers are flowing one way, all the dips should be bought but if all the rivers flowed the other way, every rally should be sold." He admits to not knowing where the rivers are flowing now but he's obviously more cautious in this environment and expects the market to correct further. Now, what is Tepper talking about? He's basically trying to gauge global liquidity trends to see whether they're supportive of risk assets. He rightly points out that the mighty greenback, the slide in commodity prices and China's Big Bang have hit the reserve currencies and will impact earnings which is why "the market needs to adjust to a new reality." Still, the effects of global monetary policy have yet to be felt in the economic data as many PMIs, especially in China, continue to point to a global slowdown. In fact, Willem Buiter, Citigroup chief economist, sees a storm brewing in China. This week, he estimated that there is a 55 percent chance of a made-in-China global recession in the not too distant future, which he defines as a period of sub-2 percent global growth. But as I explained in my comment on betting big on a global recovery, pessimism may be overdone here and we might be on the verge of a cyclical recovery which is why some hedge funds are loading up on energy (XLE), oil services (OIH) and metal and mining stocks (XME) -- ie., all the sectors that got decimated this year. Unfortunately, these and other bets aren't panning out thus far which is why many small and large hedge funds are taking a beating this year, unable to cope with heightened volatility in these brutal markets. And they're not alone. Mad money is wreaking havoc on many institutional portfolios, including those of U.S. state pension funds. No wonder CalPERS and CalSTRS are cutting financial risk and reviewing their risk mitigation strategies. And now the world awaits the Fed's decision next week. Will it raise rates or won't it? Who knows? After the release of the eagerly awaited US non-farm payrolls report last Friday, Federal Feds Funds futures got re-priced to a 32.0% chance of a rate-hike in September from 26.0%. I agree with those who think if the Fed hikes rates this year -- even it's a "one and done" hike -- it will be committing a monumental mistake, one that will exacerbate its deflation problem. The Fed needs to heed the bond king's dire warning and stay put until U.S. inflation expectations start rising from these low levels. And if Leo de Bever is right and lower oil prices are here to stay, I don't see any reason to raise rates anytime soon. Getting back to David Tepper and markets, I think he's right in one sense but wrong in another. I would continue to steer clear of or sell and even short the rips in energy (XLE), oil services (OIH) and metal and mining stocks (XME) for now until I see evidence of global PMIs rebounding. But I would definitely buy the big dips in biotech (IBB and XBI) and selective technology shares (QQQ) as I see the uptrend in these sectors continuing. The stock is up 8% on Friday morning but only after it sustained an 80% haircut on Wednesday. And if you look at the yearly chart, it was actually beautiful before Wednesday but a lot of investors got clobbered here. And who are the top institutional holders of Mirati Therapeutics? Who else? Fidelity, the Baker Brothers, Broadfin, venBio Select, the typical top biotech investors. I wouldn't chase it here but that was a very nice dip to buy recently. Unfortunately, this is the nature of investing in biotech, it's a wild and crazy ride up and down. 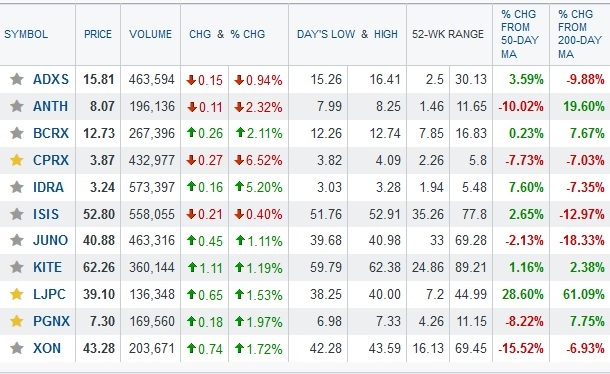 These stocks are highly speculative which is why I tell investors to focus on ETFs. If you want to focus on individual stocks, diversify and focus on what top funds are buying. I can tell you there is big money to be made buying the big dips on these stocks but it's nerve-racking as you can get whacked hard at any time. Below, I embedded some clips from the latest Tepper tantrum. Listen carefully to him but take everything these hedge fund gurus say on television with a grain of salt and always look at their book, not what they're saying publicly. 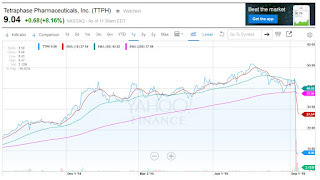 If you look at Tepper's latest stock holdings, he's still pretty damn bullish! (At least Bill Ackman is more bullish on stocks and honest about that even if he's getting clobbered this year). That's all from me this week. I ask all my readers, especially institutional investors, to donate and subscribe to my blog on the top right-hand side. I thank those of you who continue to support my efforts and wish you all a great weekend! Who Gets The Last Laugh on Stocks? Ontario Teachers’ Eyes London Expansion? The End Of The Deflation Supercycle? Sea Change At The Fed? Harvard Endowment Warns of Market Froth? Caisse Taking Less Real Estate Risk? It’s All Up to Tsipras Now? The Case Against Brian Moynihan? Why Is Ray Dalio Worried? CalPERS Grilled on Private Equity? Beware of Large Hedge Funds? CPPIB and PSP Buy South Korea's Homeplus? Private Equity Doubling Down on Energy? CalSTRS Reviewing Risk Mitigation Strategies? Mad Money Killing State Pensions?